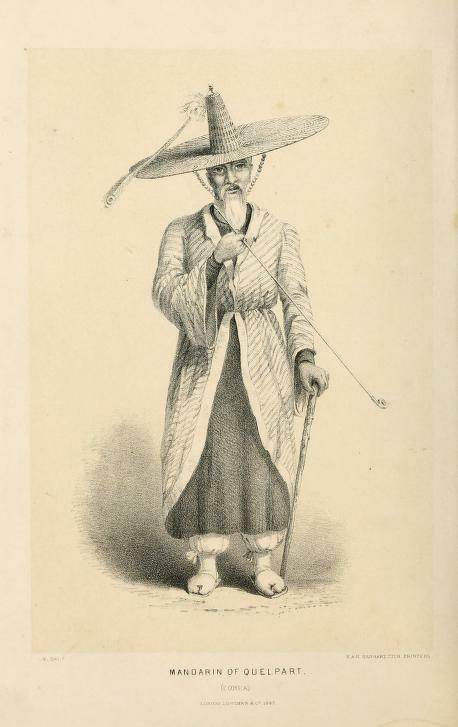 Borneo and The Indian Archipelago, Drawings of Costume and Scenery. Late Midshipman of H. M. S. Samarang, Surveying Vessel. London: Longman, Brown, Green, and Longmans, Paternoster-Row. June 24. Sighted the Goth island, a portion of the Japanese empire. The next morning the wind had increased to a heavy gale, and we were compelled to reduce our canvass to a close-reefed main topsail, staysail, and trysail. We rounded Cape Goth within a quarter of a mile, and lay to under the lee of the island, where the sea was comparatively smooth. Towards the evening the wind subsided, and we again made sail. Saw the island of Guilpat, and the next morning anchored off the north-east side of it, in a channel between Guilpat and a small island. We landed on the small island, where we were received by about sixty natives, who did not appear well pleased at our intrusion, but knew that resistance to us would be useless. In the course of the day several thousand natives had assembled on the opposite shore. By the aid of good telescopes we could discern forts and flags. 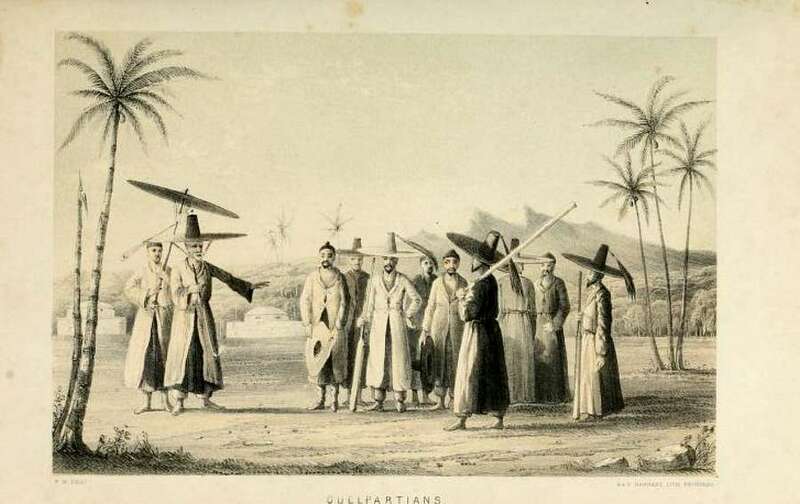 The natives informed us that Guilpat had a standing army, well supplied with matchlocks, swords, and bows and arrows. They added that guns are not wanted to defend the island in case of need. This assertion we afterwards found, making allowance for a little exaggeration, to be quite correct. The island of Guilpat is subject to the kingdom of Corea, and is the largest in that archipelago, being about thirty miles in length and fifteen in breadth. It is composed of innumerable hills in every variety of form, such as cones, saddles, and tables. Most of these hills have forts built on their summits. From these, lights were displayed every evening, and it was astonishing the rapidity with which these signals were answered. I have seen the whole coast illuminated in less than five minutes, each hill appearing like a little volcano, suddenly bursting out. As soon as the boats had surveyed this part of the, island, we shifted the ship to where the survey was being carried on; and this we continued to do during the whole time that we were employed in the survey, the boats returning on board every night. Good anchorage is to be obtained all round the island. Innumerable forts and batteries are built along the coast; every rising ground being surmounted with one, although the major portion of them were not supplied with guns. We found as we coasted along that all the forts were manned, the people being armed with matchlocks, spears, and arrows. On several occasions they tired their matchlocks, and the salute was returned by the 6-pounders in the barges, which never failed of putting them to flight. In the centre of the island the land runs to an enormous height, and terminates in a sharp peak, which, in consequence of its always having been enveloped with clouds, we did not see till several days after our arrival. At last we arrived at the principal town, which is situated on the western side of the island. The town was inclosed with thick walls, higher than we had observed before as we coasted along. These walls form a square, each side of which is about half a mile in length, and has batteries, parapets, and embrasures. In some of the latter there were guns, which were occasionally fired. The whole ground before the town, for the distance of a mile and a half, was crowded with people; but if they waited for our landing they were disappointed, as the captain would not land. They gave us two bullocks, which were put into the barge, as the ship was then ten or twelve miles off. The mandarins used every argument to persuade the captain to come on shore and visit the chiefs of the island; but, as we had but twenty men in the boats, he refused to trust himself among eight or ten thousand whose intentions were any thing but satisfactory. However, he promised that he would come on shore on the following day, but that at present he was obliged to visit a point of the bay to obtain observations before sunset. We now prepared to move in the barge, but found ourselves encompassed by twelve or fourteen large boats, fastened to each other by strong ropes. We desired them to make a passage, but they either did not, or would not, understand us. This looked very much like treachery, and decided measures were become requisite: the nearest boats were boarded, and the crews made to cut their ropes. Some of them appeared inclined to resist, but a smart stroke of the cutlass put their courage to flight. This aff"air took place withm twenty yards of the beach, and in sight of 10,000 people on the shore. We now being clear, pulled for the point and secured our station. A great crowd collected around us while we were observing; the chiefs expressed a wish, in a peremptory sort of way, that the ofiicers should partake of some refreshment at a short distance from the beach. This the captain, who suspected treachery, refused, and as we were going near to our boats, some of the natives laid violent hands upon our men, but having received from them a few specimens of our method of boxing, they soon quitted their hold. The Chinese interpreter was now missing; our men in consequence procured their arms, and landing, a strict search was made for him. He was found some little distance on land, having been enticed away by one of the chiefs, who was plying him with sam-schoo. On his way to return they forcibly detained him, and were in the act of conveying him away, when the appearance of the armed party from the boat surprised them, and they hastened to convey their own persons out of reach of our bayonets. It was not, however, our intention, or our policy, to commence hostilities, only to show them that we would not be trifled with. We returned from the point to the beach before the town, when the boat's guns were loaded with round and grape, and pointed at the crowd assembled, in case of any further treachery. The captain then landed with the small armed party, all ready for resistance. Music was now heard in the distance, and soon afterwards one of the principal chiefs arrived, walking beneath a silken canopy. He was attended by two young lads and a band of spearmen, who prevented the mob from approaching too close to his highness's person. The multitude shouted, and bowed their heads to the ground as the chief passed them; the latter took no notice of their acclamations, but advanced in a very stately dignified manner towards the captain, apparently keeping time to the music, which was played by a band of men, dressed in a very fantastic manner, on cymbals and instruments resembling our clarionets. The negotiations were now opened: the captain expressed his surprise and disgust at the treatment he liad experienced at the point, where he had been taking observations. The chief inquired of the captain, in reply, why he did not shoot the offenders ? and assured him that, if the next time he was annoyed by the rabble he would shoot a few of them, it would have a very salutary effect upon the remainder. In the course of conversation, the captain informed the mandarin that England possessed ships carrying 120 guns of larger caliber than those on board of the vessel he commanded; and that altogether, including large and small, the Queen of England had 800 vessels. This account was evidently discredited, as it always was when such an assertion was made in those seas, for looking round him and explaining the nature of the communication to his followers, they all laughed. Asang, the interpreter, then gave them a history of the Chinese war, on which he dwelt upon our immense resources, the size and number of our vessels, and the fire ships (steamers) which we had employed; but it was evident that the Quelpartians did not believe one word of his assertions. Before the conference was over, rice, cakes, and sam-schoo were handed round, and the captain promised that he would visit the chief mandarin on the following day. By this time, the ship had come to an anchor in the bay, and we returned on board. The next morning we got the ship under weigh, and brought her nearer to the town, so that her guns could be brought to bear in case of need; but when within 100 yards of the shore, and in the act of going about, the ship struck with great violence against a rock. Hawsers were laid out, and with our usual good fortune, we again got into deep water, and in half an hour anchored off the town in a favourable position for cannonading it. We then landed our force, consisting of all the marines, with the drummer and fiddler, besides a party of small-arm men from the blue jackets, all armed with muskets, bayonets, and cutlasses. The ofiicers, in addition to their swords, carried pistols in their belts. A feu-de-joie was now fired, for the double purpose of creating an awe among the crowd, and ascertaining that all the muskets were in good order; for the mandarin resided some miles from the beach, and in case of attack we must have fought hard to regain our boats and the protection of the ship's guns. All being ready, the drummer and fiddler struck up a lively air, and we commenced our march towards the mandarin's house, the officers being accommodated with horses. After passing over a morass, the waters of which ran skiggishly through the arches of a bridge, connecting the suburbs with the city, we ascended a rocky eminence, from the summit of Avhich we had a bird's eye view of the city, and some portion of the interior. We observed that the ramparts of the city were lined with people. Our train was nearly a mile in length, although the natives were walking ten or twelve abreast. Immediately after our party came the band of the natives, dressed in russet-coloured cloth, with shawls of the same material; after them the mandarin, followed by above 200 soldiers, a dense mob bringing up the rear, with flags and banners displayed. On the inland side of us was an immense plain, bounded in the distance by high mountains, whose tops were enveloped in clouds. This plain was mostly cultivated; that portion of it which was barren had been appropriated to burial grounds, several of which we passed through. At the head of the graves were stone figures intending to represent human beings, but Chantry had not been employed. At length, having walked round two-thirds of the walls, we entered a defile, leading to one of the gates of the city, but to our surprise, when we arrived at the gate, we found that it was locked, and when the cause was demanded, we were informed that the mandarin refused to allow the soldiers to enter, but that the officers would be admitted alone. This communication greatly irritated the captain, and our position caused us some uneasiness. We were inclosed within two high walls in a narrow lane, our advance prevented by the locked up gate, and our retreat must be through thousands who had formed the cavalcade, and were now in our rear. Our only passage was through this multitude, and I hardly need say that we were convinced of the treachery of the people. However, there was no time to be lost: the word was given, the marines formed a front line. cocked their muskets, and then brought them to the charge bayonets; and in this way, the crowd retreating before us, we forced our way back, until we were again clear of the high waUs which had flanked us; but our position even then was not pleasant. We had to pass the fort and several encampments before we could arrive at the beach, which was at least four miles distant. However, we put a good face on the matter, and forcibly detaining one of the mandarins upon the pretence that he must show us the way back, with the threat, that upon the slightest molestation on the part of his countrymen, we would blow his brains out, we commenced our march back to the beach, our two musicians playing with great energy, "Go to the devil and shake yourselves," which tune, struck up upon their own suggestion, was the occasion of great laughter among our party. At last we reached the beach without opposition, and the mandarin, who was terribly alarmed, was released. When we arrived, the chiefs attempted to throw all the blame upon the head mandarin, but the captain would no longer stand their humbug. He replied to them, that if any of their principal men had visited the ship they would have been treated with respect and kindness, and that the number of their armed retainers would have made no difference in their reception; that he considered them as faithless in all their protestations of good-will, and from thenceforth he should place no reliance on any thing that they said; that for the future he would act as he thought proper without consulting them, and that he would shoot any one who attempted to interfere with him. We then got into the boats and returned on board, where we heard that the cutter's crew had been compelled to kill or wound some of the natives, who had come down in a body and attacked one of the men with firebrands. The cutter was at anchor a short distance from the shore; on the natives approaching they seized their muskets, but did not fire until their shipmate was in danger of his life. Two of the natives had fallen and had been carried off by their comrades. The Quelpartians cultivate paddy (from which they distil their sam-schoo), sweet potatoes, and radishes, which, with shell-fish, form the principal articles of food with the lower classes. Pigs, bullocks, and fowls appeared to be plentiful, although we obtained but few. All their towns are enclosed with a stone wall; the houses are also built of stone, and mostly tiled with a species of red slate; but we had few opportunities of inspecting them, as the natives kept so strict a watch upon us, and so outnumbered us. These Coreans presented a strong contrast to the Loo Chooans, who are so polite in their manner and kind in their demeanour. These Quelpartians, on the contrary, are very unprepossessing in their appearance, rude and boisterous in their manner, and of very gross habits. They insisted upon feeling and inspecting every article of our clothing, even baring our breasts to ascertain their colour, and in many other respects proving themselves very annoying. This was submitted to at first, with the hope of securing their goodwill, but afterwards very decided measures were taken to repulse these dirty wretches, whose clothes smelt most offensively. They have the high cheek bone and elongated eye of the Tartar, or northern Chinese, from whom I am inclined to think they are descended. The crown of the head is closely shaved, leaving a circle of long hair, which is tied in a knot on the top of the skull (similar to the people of Loo Choo), but without any ornament. Round the forehead is fastened a bandanna, about four inches in width, resembhng fine net-work in texture, but it is made with horsehair. This is used to keep the hair in its proper position. But the most singular part of their costume is the hat, which is made of the same materials as the fillets: the brim is about four feet in width, and this gives to the wearer a very grotesque appearance. The crown in shape resembles a sugar-loaf with the top cut off, and is very small in diameter. It admits the top-knot of hair, and nothing more. The lower orders generally wear a felt hat, but of the same dimensions and shape. The hats of the mandarins are secured on their heads by strings of amber beads and large ivory balls, and then passed under the chin. Rank is denoted by the peacock's feather in the hat. The army are distinguished by a tuft of red horsehair stuck in the crown. The respectable part of the inhabitants have several garments; the outer ones are of various colours, but the cut of them extends to all ranks. I can liken it to nothing but a long pinbefore, slit up in front, behind, and at the two sides. Under this they wear other garments, the texture and quality of which, as well as quantity, depend upon the wealth of the wearer. The sleeves of their dresses are wide and long. In spite of their thick mustachios and long flowing beards, they have the appearance of a very effeminate people. One evening we saw a large turtle asleep as we pulled along the coast. A Sandwich Islander, belonging to the gig's crew, went in the water and turned him, holding him in this position till a rope was made fast to him, and he was secured. At night we landed on a small island, and we cooked our prize for our supper. I mention it as a proof of the man's dexterity. Completed our survey of the Quelpart, and stood to the N.E. The next morning we found ourselves close to a labyrinth of islands, not laid down on any chart. The captain named the group after the ship; and, having in three days completed the survey of them, we stood further to the northward and eastward. It would be tedious to detail our surveying operations. We saw the main land of Corea, but did not go on shore; and our provisions getting low, we bore all for the southward. After calling again at Quelpart, where we remained a few days, we made sail for Nangasaki, a seaport town in the empire of Japan.